We feel that the proposal does a good job of achieving many of these within the constraints that exist. We are disappointed that the route could not be extended to the Wellington gyratory but appreciate the efforts TfL has made to get to the current proposal on the table. There are issues that could be addressed to improve the scheme. 1) Redesign the new roundabout so that it facilitates the bus turn around only and is not for vehicles heading south to return north. In effect the end of the enhanced central reservation can be built into the half-roundabout. (South bound vehicles wanting to turn north can already turn outside St Michaels or the Gatehouse.) This should reduce the risk of delay and road blockage. We propose no changes to priority or other road markings (as set out in the proposal) as a result of this. 2) Further and consequent to the point above, consider moving the new mini-roundabout a few metres south (towards the Gatehouse) to move away from the Red Lion pub, school entrance and garage. The final street light in the central reservation could be suppressed. We welcome the news that hybrid low emission buses could be in Highgate within a couple of years of the scheme being brought into effect. 3) Street furniture needs (indicator boards, seats, shelters, bins etc) on the east side to be discussed with the school. The proposed shelter on the west side of North Road could be suppressed. 4) Stops B and Z1 to be moved a few metres closer to the roundabout (about 10m is possible? ), away from the pelican crossing and to block less light from the classrooms. Bus stops to be shortened as much as possible (cut to be less than 40m compared to the planned 54m?). 5) There is a fear that the narrower road and all the other improvements, while welcome, make it easier for the road to get blocked by inconsiderate delivery vehicles, emergency vehicles, double parking etc. Is it possible for part of the greened central reservation to be paved with the tegula setts? The central reservation need not be a straight edge – where there are no trees the edge could be curved, making it easier for an emergency vehicle to pass. 6) We would also ask that bike park racks are not placed on the newly extended pavement sections on the east of North Road. Currently that prohibited space acts as a stopping place for emergency vehicles. Instead of being built up can the areas of pavements at each of the echelon parking be raised setts? There would be space for bike racks on the existing pavement. 1) Bus engines to be switched off at all times when parked. 2) No drivers to smoke within sight of the school/pupils. ￼3) Default is that the 271 double deckers be parked in Z1. If a 271 arriving at the empty bus stop is the next bus to go, but not for some minutes, it can easily wait near the roundabout, again keeping it away from the school rooms. 4) In light of the potential for the narrower road to get blocked more easily, what support can TfL offer to help the community get enhanced enforcement of parking by the council or longer CPZ hours? 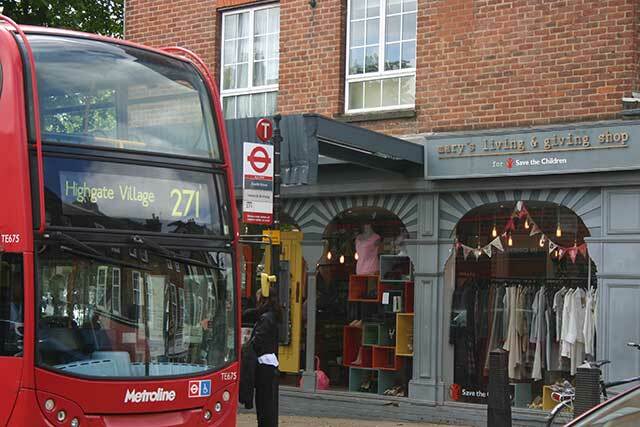 5) We would hope that the in-bus announcements could be clarified for Highgate to make it clear that the bus has reached the centre of Highgate village. 1) Who owns the land under the current 271 terminus? And do any plans exist for its future use? 2) We understand that the plan is to stop the 271 as it heads north up the High Street where the 210 and 143 currently stop. We note that there are no street markings indicating the southbound bus stop on the High Street. We feel that such markings would improve the traffic flow in that area – and will be needed more if an extra bus is stopping there. The Forum would be disappointed if many of the features in the proposal designed to improve the look of the area (for example the greening), to slow traffic (we are concerned about speeding on North Road out of peak hours) and to improve safety (especially the pavement area around Castle Yard and St Michael’s) were watered down. No new mini roundabout, no narrowing of North Road. It is difficult to speed in North Road, there may be a few speeding motorists . Better signage and/or speed camera can slow traffic. No widening of the central reservation , nor lengthening of the central reservation, no extra trees needed . no widening of pavements , why cycle racks as there is no cycle lane and the proposals if carried out will prevent a cycle lane being created in the future. The entire plan lis a shambles. North Road residents were not consulted. They are against most of these ill thought lout, dangerous proposals. as are many residents of Highgate. Most of the shopkeepers wish to keep the 271 terminal in the village,the residents of North Road do not want another night bus terminal in their road. ( We also have night bus 214, and buses 143 and 603 and many large coaches hired by Highgate School. So HF the majority want to keep the 271 in the village. It brings footfall for the shops, who are already struggling, women especially feel safer in the village, rather than on North Road. There are clearly some respects in which the Forum’s considered view differs from yours. On some points we agree – some changes to the proposal could improve it and the Forum has responded accordingly. But on a few important points your comments merit a response. The plan is not a “shambles” – it has been drawn up by professionals at TfL and many people who have studied the issues around Highgate and further afield think it is good even if (some) residents on North Road disapprove. Disagreement with a proposal does not mean it is a shambles. Also, residents of North Road WERE consulted. TfL has followed standard procedures, forms were delivered to doors (GPS tracking supports that view), the Forum wrote this blog, meetings have been held and the TfL consultation period was extended! Finally, there will still be a 271 bus stop in the High Street – it will stop where other buses stop and surely that is an improvement. I do not know where this idea comes from. Of course, not everyone agrees on everything but lets at least get the facts straight and work together to make Highgate a better place. Well, this woman has never felt unsafe on North Road and, of course, more buses stopping there will mean more people and therefore it will be even safer. And as for the majority of people being against: in fact moving the 271 bus stand from Pond Square has been a key priority raised by hundreds of people during consultations over the years we have been making the neighbourhood plan. We believe that creating a community space instead will in fact make the High Street a safer and more attractive place to hang out or shop – and thus increase the all important footfall for traders. In addition, the proposals will make North Road greener and safer by turning a four lane highway into a two lane road and – crucially – removing the current dangerous 214 turnaround right outside St Michaels School. A resident of the other part of North Road (usually forgotten, often denominated North Hill), I strongly support the removal of the 271 bus stand from the heart of the village. I also have some sympathy for the affected North Road residents over the loss of amenity. Could the clash not be resolved by TfL’s stopping the 271 at Archway and using the resulting economy to increase the frequency of the 143? Also: there was talk of the left turn from North Road into Castle Yard being prevented. I hope this crazed idea has been dropped. The “talk of the left turn from North Road into Castle Yard being prevented” was just one of those fantasy scare-mongering grumbles dreamt up by someone (don’t know who) who couldn’t be bothered to read the proposal or ask anyone who had been working on the project! So, no, no-one has proposed it! Regarding “stopping the 271 at Archway” – this was one of perhaps 8-10 ideas that had been discussed. It was not welcomed by TfL as they expected many what they call broken links. Too many disrupted and broken journeys. They do not want to cut routes when more people are using buses. Many in Highgate felt that stopping some 271s at Archway and running others to the Wellington for example (a bit like your idea of boosting the 143) could also be an option but that also did not meet with TfL approval.